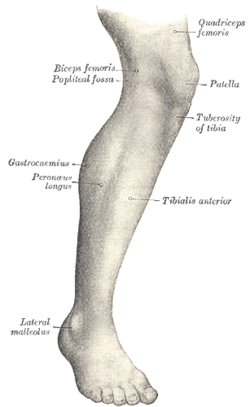 The human leg, in the general meanin, is the entire lawer extremity or limm o the human bouk, includin the fit, thee an even the hip or gluteal region. ↑ "Lower limb". Dorland's Medical Dictionary for Healthcare Consumers. Elsevier. Retrieved 18 April 2009. This page wis last eeditit on 29 Apryle 2017, at 17:25.